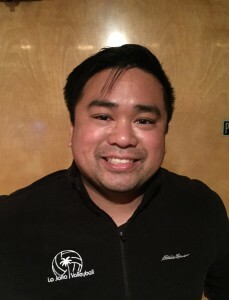 La Jolla Volleyball welcomes back Lawrence “Law” Ortiguerra for his third season on our coaching staff! Coach Law, a San Diego native, began playing volleyball because he wanted to jump higher. Although short in stature, he was very competitive in Tae Kwon Do and even went to the Junior Olympics. He began a demonstration team and needed to work on his high flying kicks. He joined volleyball to develop his jumping and became a two year varsity player at Montgomery High School. Continuing his love for the game, Law began to coach volleyball after college. He started at High Tech High as the girls JV coach and is now in his tenth season as the varsity head coach. In addition to High Tech High, he has also coached with the Point Loma Starlings Volleyball Club, Beach & Bay Volleyball Club and the Point Loma Nazarene Women’s Volleyball club team. He has even coached on the boys side, serving as Point Loma High School’s boys JV coach for three seasons and the HTH boys varsity team for two. He is excited to coach his third season with La Jolla Volleyball Club! Check out Coach Law’s High Tech High personal website for more interesting information!